Currency trading is very popular on online trading platforms. It provides the opportunity to assess and judge the relative strengths of two currencies and make profits from the correct analysis. The GBP JPY currency pair is an interesting one. It is highly volatile and brings together two of the most influential nations on the world stage. 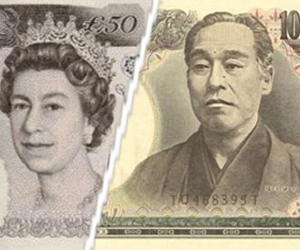 Trading this pairing is generally considered to be best for the more experienced traders due to the interesting relationship the YEN has with its economy. Great Britain has historically been an important world economy. Although this status is somewhat diminished the British Pound remains a strong and popular currency around the world. Britain was massively affected by the credit crunch of 2008. Recession followed, as with most of the world, and there have been years of recovery measures put in place. Austerity measures introduced by the Conservative Government were put in place to get debt under control and probably salvaged the Triple-A rating (Jan 2013). The UK economy strength is indicated by the FTSE 100 and FTSE Futures. Japan is the 3rd Largest economy in the world, after the US and China. It has become a powerhouse manufacturer of electronics and automobiles, both of which are exported to all corners of the word in vast quantities. The Japanese reliance on exports means that the world economy can hinder performance. However, exports are somewhat diversified around the world. The Japanese YEN is most useful to the economy when it is low, as a low YEN keeps exports ultra-competitive. Traders should be wary of the relationship the YEN has with its economy, and of Central Bank interventions. Wanting somewhere to trade GBP/JPY online trading? All the brokers` review you can find here are tested, verified and approved by our experts. That is why you can be sure that after having chosen any of GBP/JPY online trading brokers from our list you will get an excellent trading experience. Moreover, you can easily find online trading videos together with other various education materials almost in every broker. We hope that GBP/JPY online trading will become a new interesting and captivating activity that will bring you high payouts.